Dinner, as art, with a convertible Land Rover, in a former auto dealership. Thousands of car dealerships were shuttered in the wake of the 2008-2009 financial implosion. The Used to Be a Pizza Hut of our contemporary era, many of these structures have found creative reuse as fitness clubs, dry docks, tow lots, churches, supermarkets, flea markets, and even a Sheriff's department dog training facility. 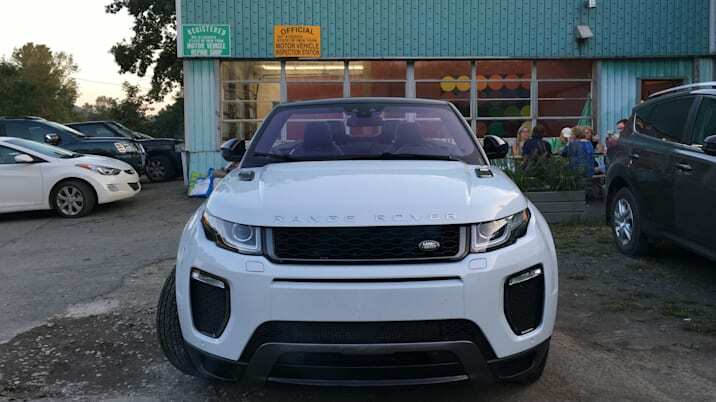 DaBrescia Motors has had a more intriguing fate, one that merited corralling a carload of friends and a white Evoque convertible for a top-down drive upriver on the last warm night of summer. DaBrescia Motors was founded in Hancock, New York in the early Forties by local businessman Arthur W. DaBrescia, its angular International-Style plate-glass showroom walls and ribbons of metal-framed casement shop windows topped by a robin's egg-blue metal panel façade. For decades it was a fixture in this small Delaware River town three hours northwest of New York City, selling and servicing Pontiac, American Motors, and International Harvester vehicles out of its handsome riverfront location. People familiar with the American auto industry will note that these marques are all defunct, vanished from the marketplace. The same could be said for many of the businesses in Hancock, where a number of storefronts stand vacant, and extractive industries like logging and bluestone aren't exactly what they used to be. But like underutilized neighborhoods in Manhattan—the post-industrial SoHo of the Sixties and Seventies, the post-slaughterhouse Meatpacking district of the Eighties and Nineties—towns like this, within a day's round trip commuting distance of New York, have drawn artists, writers, and artisans looking for an inexpensive, and thus liberating, space to create. Innovative art dealer Gavin Brown had galleries in both of those Manhattan neighborhoods, where he launched the careers of numerous contemporary stars including Elizabeth Peyton, Anselm Reyle, Peter Doig, Jake and Dinos Chapman, and Rirkrit Tiravanija. Brown has since moved his gallery to Harlem, and bought a vacation house near Hancock. And now he's added to his stable of properties this former car dealership, now repurposed as a gallery/community center/performance venue called UncleBrother. 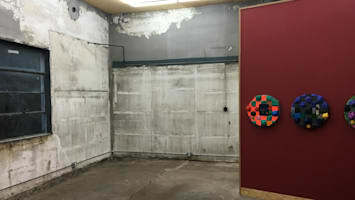 According to a local I spoke to on site, the inaugural installation last summer looked like no art at all. Stacks of tires stood in the bays, as if just where they'd been left when the dealership closed years before. But upon closer examination, it was revealed that the tires had been cast in bronze and arrayed in their original location, a playful meditation on the permanence of transience, the implacable yet evanescent quality of memory. I drove up to UncleBrother for one of its last summer weekends in a new, white Land Rover Range Rover Evoque Convertible, the unwieldy name of which is reflected in the cute-ute's awkward soaking-tub-on-wheels design, as well as its retractable fabric roof, the longest one currently on the market. 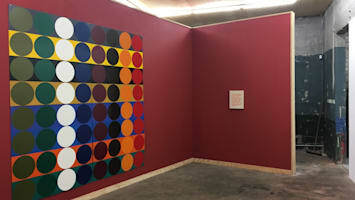 The current exhibit at UncleBrother—brightly colored paintings and sculptural reliefs from Poul Gernes Brian Belott, and others—was mounted on wine-red temporary walls in three of the former service bays, lit by simple rectangles of fluorescent bulbs on a fresh plywood ceiling. 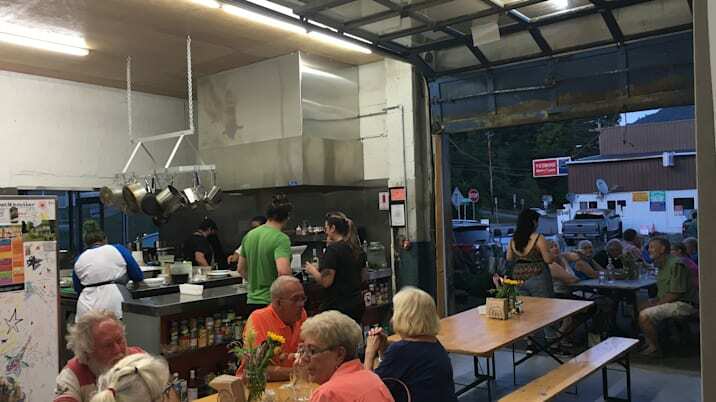 But more intriguing was a curry restaurant in the showroom, a high-ceilinged space with an industrial kitchen and pair of communal tables separated from more tables outside by a raised floor-to-ceiling garage door. The kitchen itself is something of an installation, run as it is by the aforementioned Thai artist Rirkrit Tiravanija, who is represented by Brown, has a country house of his own in Hancock, and who is famous globally for his participatory food-as-art dining installations in which museumgoers, critics, gallery visitors, and sometimes the homeless are invited in to hang out and partake of his cooking. Never one to turn up my nose at edible art, my eight friends and I nabbed a table. The food was fresh, cheap, and relatively tasty, a $20 prix fixe of local greens, curried vegetables, dumplings, Thai chicken (or veggie) tacos, and sweet Thai tea custard cake. Locals mixed with weekenders at the long tables. An older man seated just behind the Evoque's planar rear called me over. "Is that your car?" he asked. I nodded yes, a bit obliquely. He removed his white ball cap. "Wow. Just, wow. My hat is off to you, sir. That is something else." Oddly enough, these early Land Rovers also came from the factory painted almost exclusively in a surplus British armed forces blue-green, a shade of teal that's not so far off from the embellished metal panels of the old DaBrescia dealership. Art is about the process of making things fit together, even though (or, sometimes because) you know they fit wrong.